You want reliable, high-quality phone systems that simply work. And with your business in a constant state of change, sometimes simple suffers. But today, transforming your phone system is simple regardless of your business—whether you have ﬁve employees or 500. We are a world of entrepreneurs always on the move. With employees in other states or emplyees working form home. Working from home or the road. 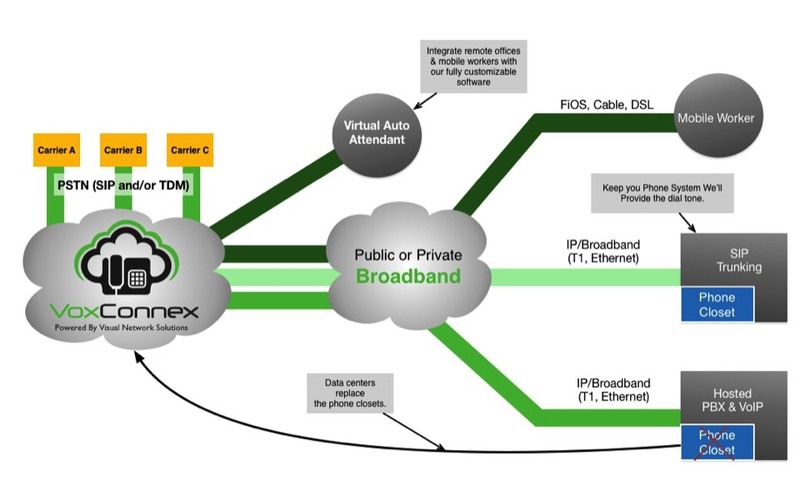 With Visual Network Solutions VoxConnex® Virtual Phone System(VPS). Create a greeting and route to any cell phone or landline. Sound professional and stay conneted to your customers and team members no matter where they are located. We offer er SIP Trunking (virtual phone utilizing broadband access connection) solutions for any sized-business—whether you’re a small business looking for the ﬂexibility and cost savings of VoIP or a mid-sized business looking for business continuity, disaster recovery, and unlimited or metered calling plans, we help you save up to 40% over traditional telephone lines.